How long will the Kingdom of Christ last? Nathan Jones: Let's talk about another controversial topic concerning the end times, and that's the Millennial Kingdom. Dr. Hutchings, can you tell a little of what you know about it from the Bible? How long is it going to last? What is its purpose? Dr. Hutchings: We read in Revelation 20 that after Jesus Christ comes He will reign upon the throne of David for a thousand years. That's a thousand years, also called a millennium. The Millennium is something that Israel looked forward to in the Old Testament, in that the king from David or the lineage of David would come and sit upon the throne of David, and there would be peace on the earth for a thousand years, meaning a millennium. We're given imagery like the wolf and other animals wouldn't eat prey, and it will be a peaceful world. Nathan Jones: I got that from Isaiah 11:6, "The wolf will live with the lamb, and the leopard will lie down with the goat. The calf, the young lion and the fatling will be together and a child will lead them." The animals were told will live in peace with each other, and so will mankind with each other. That the nations are at peace then tells me that we're not living in the Millennial Kingdom now, right? Dr. Hutchings: Yes, there are many reasons why we are not now living in the Kingdom Age. Nathan Jones: Please share some of those reasons, for seriously, I wouldn't now send my kids out to stick their hands in the viper's nest, or hang out with lions. Dr. Hutchings: For one, Jesus is not reigning from Jerusalem. Nathan Jones: Now, some would say He is reigning spiritually. Why do you say He's not doing that right now? Dr. Hutchings: Jesus is to reign literally upon the throne of David, and not just spiritually. We read in Matthew and Luke His lineage going all the way back to David, and the reason for that is that lineage substantiates Jesus' claim to the throne. Jesus offered His kingdom to Israel at His First Coming, but Israel said they would not have this man reign over them. Instead, they took Jesus and crucified Him. So, He has to come again to fulfill the Old Testament prophecy that a king from the lineage of David will reign on David's throne, making it possible for there to be peace in the world for 1,000 years. And, there will be peace, and it will be a wonderful world. Dr. Reagan: I'm glad you mentioned the Old Testament prophecies, because many people believe that the only place in the Bible where there is any mention of Jesus reigning is in the book of Revelation. And yet, the Old Testament is full of prophecies about the Messiah reigning over all the world. The only new information given in Revelation 20 is how long the reign is going to be, which is a thousand years. Dr. Hutchings: Yes. The book of Hosea also has a prophecy about the Messiah being crucified, and His coming again, so the teaching of Christ's Kingdom it throughout the Old Testament and the Prophets. We read in Jeremiah and Ezekiel where their mission was to make Israel acceptable so that this great King would one day reign through that nation. Nathan Jones: Does that mean the Millennial Kingdom then is only for the Jew? Who then lives in the Millennial Kingdom? Dr. Hutchings: We read in various places in the Scriptures that all nations will come to Jerusalem to worship the King. So, the Kingdom will not only be for Israel, but it will be for all nations. Dr. Reagan: Most churches today, in fact the majority of Protestant churches plus the Catholic Church, teach what's called Amillennialism, which is the belief that we are in the Millennium now and have been in it since the cross. They teach it will continue indefinitely, and that "thousand years" is just a symbolic term. You know, Noah, that if you take the Bible, both Old Testament and New Testament, for what it says, just take it for what it says, then there's no doubt that it teaches that Jesus is coming back to reign for a thousand years. But, those folks say, "Oh, none of that means what it says. It all has to be spiritualized." Let's then talk a little bit about what is the best way to interpret Bible prophecy. Should it be spiritualized, or should we take it for its plain sense meaning? Dr. Hutchings: Of course there's a spiritual element throughout the Bible in everything that is written, but there's also a literal fulfillment that we have to accept as well. The prophecies in Isaiah 53 about Jesus, they literally came to pass. The Jews have been scattered throughout all the world, and that literally came to pass. They would return to that land again, and we can clearly see today that has been literally fulfilled. Therefore, we have to accept that the other prophecies in the Bible also have a literal fulfillment concerning this coming kingdom that Jesus is to return and establish here on the earth at the end of the Tribulation period. Dr. Reagan: Right. I grew up in a church that taught that the Bible means exactly what it says from beginning to end, unless that is it's talking about the Second Coming of Jesus, and then it never means what it says. Dr. Hutchings: A lot of churches believe that the Church inherited all the promises made to Israel. The Church they believe is the modern Israel, and therefore there is no Second Coming, because the Church has fulfilled or is fulfilling all of the promises made to Israel. Nathan Jones: And yet, Israel is back in the land again. That means something. That's prophetically important. Dr. Hutchings: Israel being a nation again is an important sign that shows we're in the end times. Dr. Reagan: I had a fellow one time put it to me this way, and I never forgot this. He said, "If Bible prophecy does not mean what it says, then how can you ever know when it is fulfilled?" You can't! If prophecy doesn't mean what it says, then indeed, you'll never know whether or not it has been fulfilled. For example, Revelation 11 says in the end times there are going to be two witnesses of God who are going to be in Jerusalem in the Tribulation proclaiming the Gospel. Now, does that mean what it says? Well Amillennialists say, "Oh, no, that doesn't mean what it says. That refers to something that happened in 70 AD." Well then, just who were those two witnesses? They'll hesitantly reply, "Well, we don't know for sure, but they might have been this or they might have been that." Dr. Hutchings: The Scripture says that all nations, races and tongues will see after the Antichrist kills the Two Witnesses at the mid-point of the Tribulation their dead bodies in the streets of Jerusalem. Before the 20th Century, people asked, "How could that be possible? You are going to bring several billion people to Israel and show them?" But, today through television, the world witnessing their deaths and resurrection can be most certainly possible. Dr. Reagan: Absolutely! We are seeing prophecies that can be fulfilled today that we could never have seen fulfilled naturally in the past, all because of modern technology. Noah, you keep on going back to modern technology, and so does Nathan. The marvels of technology today really does help us to understand Bible prophecy as we have never understood it before. 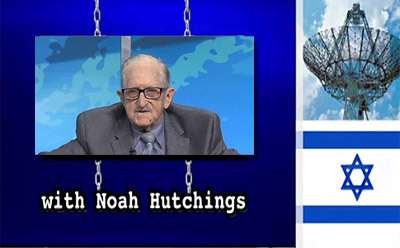 In the fourth part of this interview with Dr. Noah Hutchings on end time events, he'll give three great signs which demonstrate that we are living in the last days. Lots of good stuff here. Especially seeing and believing in God's literal fulfillment of prophecy. Explains why the Jew whose destiny is so tied to prophetic fulfillment is hated by satan.